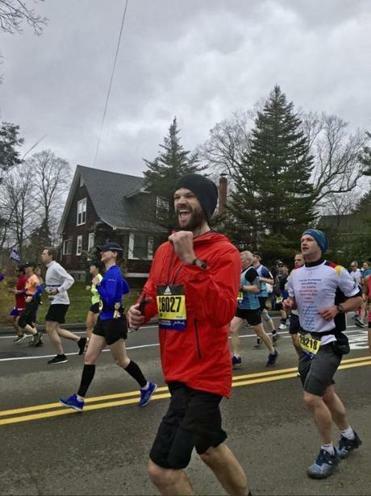 Actor Jared Padalecki runs the 2019 Boston Marathon. 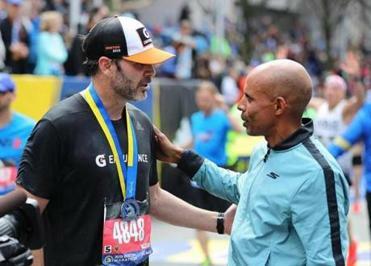 Even with numerouscelebritiesrunning the 2019 Boston Marathon, two “super” famous racers received a particularly noteworthy outpouring of fan support. Jared Padalecki, star of the CW series “Supernatural,” ran the Marathon along with his wife, actress Genevieve Padalecki (“Wildfire,’’ “Supernatural’’). The couple raised more than $30,000 as part of the Boston Marathon team for Dream Big!, a Boston-based nonprofit organization that supports underprivileged girls who want to play sports and participate in physical activities. Genevieve, who was running her first marathon and finished with a time of 3:36:57, praised the support she received from spectators along the route. Jared (pictured), who stopped multiple times throughout the race for selfies with fans, finished with a time of 4:32:24. The 43-year-old seven-time NASCAR champion finished in just over three hours. Even fans who weren’t stationed along the race route excitedly tweeted screenshots of the Padaleckis’ progress throughout the 26.2 miles. Caroline Martell and her friends Adrianna Rosadio and Angela Moruzzi positioned themselves near the one-mile marker in Hopkinton in the hopes of seeing the Padaleckis and cheering them on.